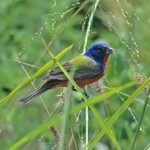 Song is series of varied phrases, sometimes paired; faster than Indigo Bunting’s. 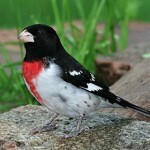 Description: Male has bright blue head, back, and throat; cinnamon breast and sides; white belly; and two white wing bars with the upper bar being wider. Female is grayish-brown above; grayish-blue rump; white underparts; and buffy wash on throat and breast. Juvenile resembles female but has fine streaking on breast. Behavior: Males spend a lot of time patrolling the perimeter of their territories, repeatedly singing from song perches; perches may be trees, bushes, or telephone wires. Habitat: Relatively open forests on floodplains or uplands, forest edges, second-growth forests, and among disturbed vegetation. Prefers habitats with a diversity of shrubs, low trees, and grassy cover. 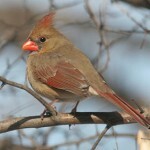 Where in Nebraska: Uncommon spring and fall migrant and summer resident in western Nebraska. Breeding is most common in Panhandle. 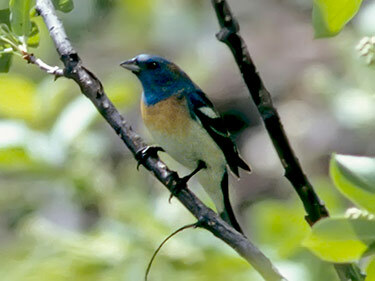 Eastern limits are confused by hybridization with Indigo Buntings. Fun Facts: Male Lazuli Buntings copy older more mature males for their songs when they first arrive on the breeding grounds. Often times they incorporate and rearrange more than one males songs into their own new individual song.